September 23rd is the official start of fall 2018! Here are some ways you can make sure the autumnal vibes play to the advantage of your vocational goals. As the leaves turn color and the air gets crisp, the great cultivar of the squash plant rises to a place of prominence in our culture. In so doing, pumpkins give you single people a variety of prime opportunities to get out and date. First the obvious: meet a date at a coffee shop, to enjoy some pumpkin flavored premium coffees. For the past few years, there have been memes online about how we all obsess over pumpkin spice. It’s a funny little quirk about the time we live in. So consider adding a pinch of pumpkin spice to your texted invitation to meet for a drink. One disclaimer: pumpkin flavored ales are terrible, IMHO. I’d stick with proposed meetings for hot drinks if you’re going to take the pumpkin spice angle. Another way you can use pumpkins to your fullest advantage is with a pumpkin-picking excursion. 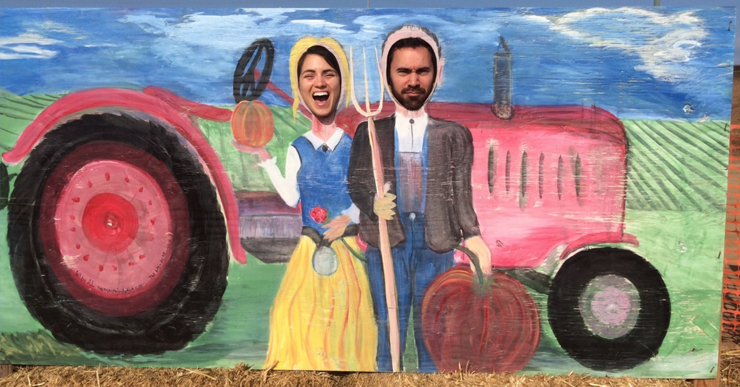 There are all sorts of seasonal, quasi-theme park, pumpkin patch farms where you can go and make an afternoon of it. Corn stalks, hay bales, and scarecrows will abound, contributing to a cozy, seasonal ambiance. Perhaps hot cider is available for purchase. Perhaps romance ensues. But that’s not all we get from pumpkins! Our round orange friends have one more way to bring people together in October, and that is via the artistic process of creating a Jack-O-Lantern. Pumpkin carving is a fun thing to do together, it’s outside the box, and it packs a punch of nostalgic fun, which can be great for getting to know someone. Ok, so maybe you’re allergic to pumpkins. No problem! Oktoberfest is another fall dating go-to. Nothing makes a phenomenal casual date quite like an Oktoberfest. Music, beer, dancing, strudels, sauerkraut in the air, more beer… it’s magical! If the two of you commit 100% and wear the customary garb, all bets are off, and I’m going to just go ahead and order the wedding gift now. Find an Oktoberfest near you, and mark it on your calendar in pen. Prost! Finally, don’t forget, Halloween is coming. This is when full-grown, mature, responsible adults are granted a dispensation, allowing them to dress up and have their picture taken. For online dating, your profile photo portfolio is crucial, so you’ve got to take note of these opportunities when they come along. Playing dress-up might seem a little silly – you’re not a kid anymore – but in a world where you want to be cautious not to come across as a selfie-taking, image-crafter, Halloween gives you a free pass to really narcissist yourself up for a while. Express to the dating world that you’re fun-loving, or that you have a rich sense of humor, or that you actually can sort of look like that movie star. It’s a chance to show a good side of yourself. Start planning now. There will probably start to be costume parties beginning in the middle of October, and you might go to a few different parties, so it’s permissible to have more than one costume per year; I won’t judge.